Before I get to the picture book review, please bear with me because I have three very important things to share. I am donating twenty-five copies of my book to libraries across the country and around the world. National Library Week starts on April 8th. For me, the library has always been a place of wonder…as a child, I took out so many books that I looked like some alien being made of books as I walked along with my two little feet sticking out beneath the stack of books that rose higher than my head. During my years of teaching kindergarten and then while parenting my own young children, the library was a treasure-trove of early childhood resources and programs. These days, I keep busy doing the Show Me How Story-time program in local kindergartens, Pre-K’s and libraries, reading the classic picture books and doing the simple craft projects that are recommended in Show Me How! Build Your Child’s Self-Esteem Through Reading, Crafting and Cooking (MoneyPenny Press, Ltd. 2010). Would you like your local library to receive a free copy of Show Me How? Budget cuts drastically reduce the number of books our libraries can purchase and all you need to do is leave a comment on this post, naming the library and telling why the people in your community would benefit from having the book available to them. At the end of the month, twenty-five libraries will be chosen through Random.org and the people who did the nominating will get to present the book to their libraries. If the library you nominate is chosen, would you also like to do a review Show Me How! on your website/blog site/newspaper/magazine? I will be happy to include a second copy in the package, just for you! So if you are interested in doing a review, please indicate that in your comment. Did you know that the first public library in the United States was started in Peterborough, New Hampshire in 1833? Did you know that Andrew Carnegie helped build more than 1700 public libraries between 1881 and 1919? Do you know any other interesting facts about libraries? I’m really excited about this…how many nominations will there be…and what states (or countries) will they come from? Does anyone know how to put up a graphic of a map and pin the locations of the libraries that are nominated? Donna Martin over at On the Write Track also has some exciting news! She will be manning (or should I say womaning) a booth at the Children’s Festival of Reading in Knoxville, Tennessee on Saturday, May 19th…and she is inviting authors and illustrators to donate signed copies of their books for her booth. I’m mailing out two copies of Show Me How to her today. This is an amazing opportunity to spread the word about your books…and, more importantly, encourage young people to become readers and lovers of books! You can find out more about the event…and the giveaway she is hosting…when you visit her website. Oh, that’s right! I said there were only three! But actually, Perfect Picture Book Friday is VERY important, so now, without further ado, my picture book selection! And with nominations for your favorite library now open, this was definitely the Perfect Picture Book! Dinosaur is going to the library…one of his favorite places. As he walks along, he meets his friends…cow, chicks, turtle and owl, and he challenges them to a roaring contest (can you guess who is the winner?) and then invites them to come along with him. At the library, he finds out that he must be quiet, especially during Story-time. Can Dinosaur hold in his roar? It’s definitely hard to hold in the roar…and young children will identify with dinosaur immediately. What child has not been told, “Hush, be quiet!” in church or when an adult is on the phone or…at the library? All of the books in author Bob Shea’s Dinosaur series are wonderful…this book is funny, the illustrations are charming and any book that celebrates reading must be a winner! Every child should have his or her own library card as soon as your local library will allow it. Make weekly trips to the library and check out the children’s programs that most libraries have going on…story-times for all ages, reading challenges with prizes, free movies and other special events. Encouraging young children to love books and reading is one of the most important things a parent can do. Does your child have his or her own bookshelf? As parents, we know that we have to feed our children’s bodies. Next time your child has a birthday, choose a book and start a collection that will feed the mind and spirit as well! 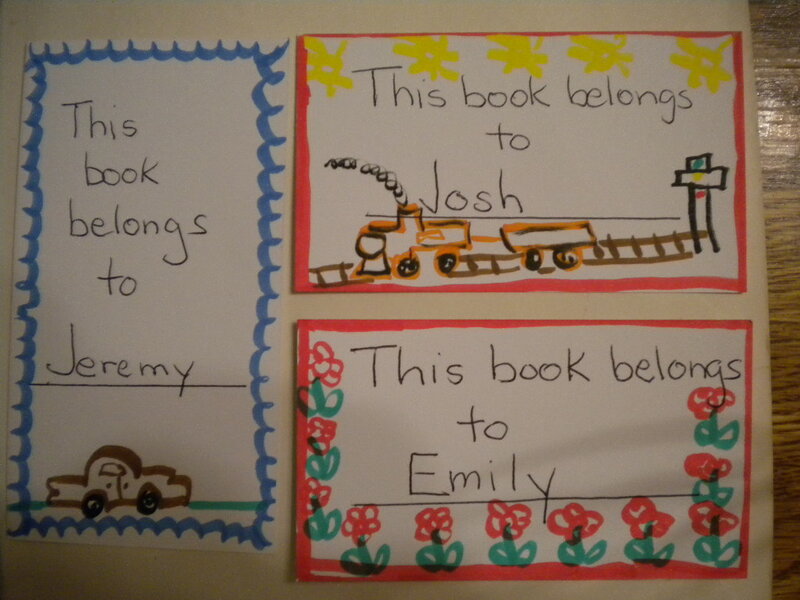 Bookplates add a special touch…they let your child know that “THIS BOOK BELONGS TO ME”. There are many instructions and printable bookmarks at the websites below. Here is a simple one you can help your child make. You will need: White or light-colored cardstock paper (or you can use construction paper or copy paper), markers and/or crayons, scissors, tape or glue stick. 1. Cut the paper to the size you would like the bookplates to be (2 or 3 inches by 3 or 4 inches is a good size). 2. Write the words: This book belongs to…and then your child’s name. 3. Let your child decorate the edges and add his own design or pictures. 4. You can also cut pictures out of magazines and paste them on the bookplate or use stencils. 5. Roll a piece of scotch tape and use it to secure the bookplate in the book or use a glue stick. 6. Tip: you might not want to tape or glue a bookplate in a vintage collector book. Here is a picture of a bookplate that my oldest son and I made together over 30 years ago. If the book looks familiar…it is! 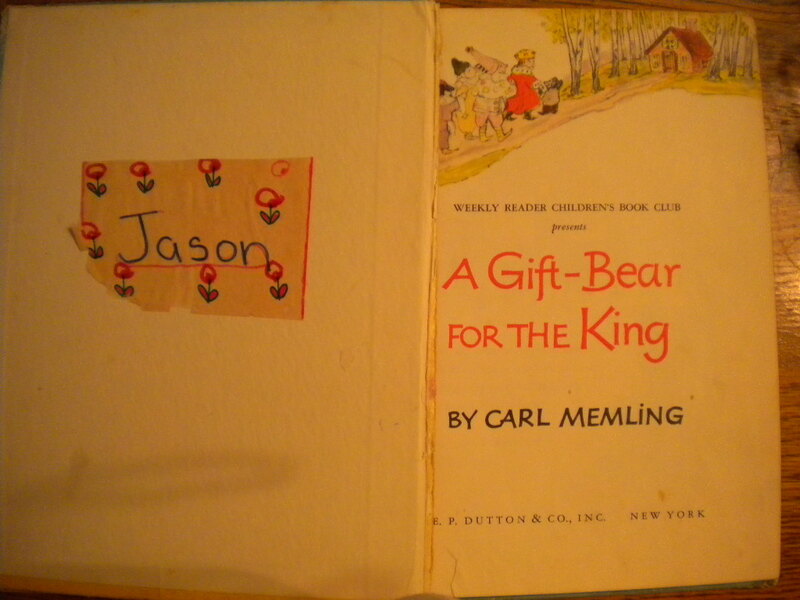 Gift-Bear for the King is the book I reviewed last Friday. Other bookplate instructions are here. Did you know that someone has a blog devoted to bookplate collecting here? I apologize for the length of this post…I hope you were all able to get through it! This post is part of a series for parents and teachers called Perfect Picture Book Fridays hosted by Susannah Leonard Hill. Click on her link and find lots of other picture book suggestions with summaries and activities. And please don’t forget to leave a comment, nominating your local library to be the recipient of a copy of Show Me How! This entry was posted in children's picture books, Crafting with Children, GIVEAWAYS, libraries, Perfect Picture Book Friday, Reading with Children, Show Me How! and tagged Andrew Carnegie, National Library Week, Picture book, Susannah Leonard Hill by viviankirkfield. Bookmark the permalink. I would love to win a copy for the San Carlos branch of the San Diego City Library system. They have seen several severe budget cuts in the past couple year. They are very limited in hours and new materials at this time. I love how they have the inter-library loan program – This book would be available to 35 branches! I would also like to feature it on my blog if possible. I think my sons would enjoy it. You kept your theme throughout. Loved your selection of PPB this week. 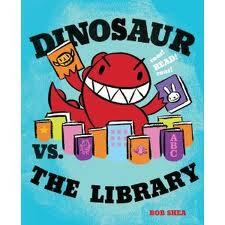 The Dinosaur vs the Library sounds like it would raise some roars of laughter from kids. Just can’t wait to see your craft activity each week. That is so gracious of you to donate your books to libraries around the country. I would love to participate, but our library doesn’t accept many donations and if they don’t want a book they pass it along. I’d hate for that to happen. Sorry you don’t think your library would accept the book (I guess some are like that…which library is it? )…but I really do appreciate your thoughtfulness…and love that you are looking out for me. 🙂 I’m excited to see all of the nominations…I posted the link to this on the main library FB page…hopefully that will help get the word out. They were all VERY important tings to say! I would love to have a copy of “Show Me How” for our local Library, The Upper Perkiomen Valley Library (http://www.upvlibrary.org/). I’d be happy to review your book also. I think it is important to tell people about the money that is being taken away from libraries. I am writing my next news paper column (I write a column for our local free paper) about how great libraries are and all the things you can do at them. I am also going to tell people how they are loosing money every year. That’s nice of you to donate books to Ms. Martin! II really like your book plate craft! The book you chose to review is a great choice and fits in with all you are talking about! I would love for you to review my book…we will wait for the end of April. Dinosaur vs. The Library is a very funny book..I’m glad you liked my choice. The bookplates are fun to make! Love the library book theme throughout, great post! Unfortunately my library has told me that they don’t accept donation books thank you very much. (Have you ever heard of anything so ridiculous). Anyway I think it’s lovely that you are doing that. Sorry your library doesn’t accept donations…I guess each library has certain rules in place…for whatever reasons. 🙂 I’m sure there are other libraries with similar rules. The cover image of Dinosaur is perfect. I love his facial expression! Your bookplate craft idea is brilliant, I think my younger two boys would enjoy this activity for their special books. Thank you! I’m going to call my library this morning to see if they accept book donations and if they do, I will let you know to enter them. This giveaway is a lovely idea! IF my library accepts donations and IF they are chosen, I would love to review your book. Thank you! sunriseovertheiceberg is Heather Newman. WordPress keeps shunting me to my son’s account. Healther made me laugh! Yes, our library does accept donations! I was relieved to hear that, with all of the funding cuts it seems silly for libraries to have a blanket policy denying book donations of this kind. It’s the Bonney Memorial Library in Cornish, ME 🙂 I’ll spread the word. The book looks perfect for my little guy and I LOVE the bookplate crafts. Thank you, Stacy! I’m sure Enzo would love the book…and the craft as well. I how I love Bob Shea and his dinosaur! Great choice! I am not going to enter your generous drawing because I am quite sure there are libraries out there more in need than our local one, which has lots of support. Very great idea on your part! Thank you for commenting, Kirsten, and nominating your library! I’d love for you to review my book…I also think it would be a good fit for Creating Curious Kids. 🙂 If your library isn’t one of the 25 that gets a copy of the book, I’d be happy to send you a copy of the book so you can review it…we’ll wait till after the contest and see how it turns out. Ok, Vivian, just keep me posted. Glad you liked the book…it is definitely a quick read. 🙂 And lots of fun! A picture book about libraries I never heard of?!? I’m so excited. I love books about the library. I know…there are just so many books out there…that’s why I LOVE Susanna’s PPBF…and her growing resource list…what an awesome tool for parents, teachers and librarians. I need to get that dinosaur book for my youngest! He’s in a roaring stage and can’t stop! Oh, I know, Milka…most of them go through that “roaring” stage. And reading books with kids that address the issues they are dealing with really does help. 🙂 Hope you can get a copy of the book. If you can let others know about the Library Project, I would really appreciate it. Bob Shea’s little dinosaur is just the cutest. I haven’t seen this one in the series, looking forward to checking it out! Thanks, Vivian! Aww this looks like such a cute book. The cover sold me! 🙂 I will add this to the list. I love your activities! Well done! And that is awesome about your project you are doing for library week. Thanks a lot for your great review! Glad you liked the book and craft, Loni! Vivian, I love the bookplate idea. My kids love going to the library and we always manage to take out more books than anticipated. The same thing happens at the bookstore, it just costs more. 🙂 I would love a copy of the Show Me How book to give to our library. I’d be happy to have an extra copy to blog about and then share with my son’s nursery school. It’s amazing what young children can do. I’m going to be covering National Library Week activities for our local online newspaper and later in April participating in World Book Night. What an exciting month! We both did Bob Shea books this week. Well, he was the illustrator only of Me Want Pet! I need to check this book out…I believe I will love it. Your library facts were great! 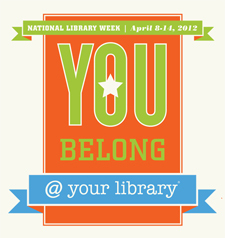 That is wonderful that you are donating your books for National Library Week! Your activity was so cute…loved it! Thank you, Penny…glad you loved the book…he is a winning author! That’s definitely a noble act from you! Lucky libraries that will receive your books. Getting our little one her own book shelf is my ongoing project. Her book collection is growing and we do need to have a good place to keep them and for her to get easier access each time she wants to read 🙂 Thanks for the reminder! Yes, I am excited about the Libfary Project…I hope lots of people get involved and nominate their local library. I really like your bookplate making idea! Thanks, Jake! I’ll be by in a bit to check out your post for Sunday! Don’t know yet what the theme is…but hopefully I can connect it to the Library Project so that more people will hear about it and be able to noninate their favorite library. If this is not within the official rules of your giveaway, I will totally understand. In that case, I would like to nominate the library itself, LeRoy Collins Leon County Public Library. Thank you for having this giveaway. Your book is wonderful! Oh yes, Martha…that is just fine! I’m so glad you nominated the Literacy Volunteers in Leon County. They are now entered to win one of the copies of Show Me How! Thanks for letting me know about this offer! I would like to nominate the Troy (NY) Public Library (Yay Troy!) for your book. And I would love a chance to review your book on my blog. Thanks for this wonderful opportunity!